Usually, everything is cheap and on sale and the best way to see the new discounts is to browse Family Dollar Ad for price drops, BOGOs, digital smart coupon savings, special sales like Christmas, New Year, etc., and more profitable things. 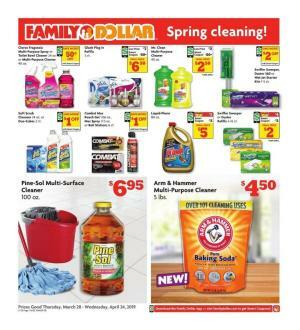 Family Dollar Weekly Ad can be a source of good deals on what we call grocery or supermarket products such as snacks, beverage packs, pet supplies, household items, and many more categories. Deal types of the retailer are Smart Coupons, Price Drops, Every Day Low Prices, $1/ea Wow! and “Compare and Save with our brands”. Weekly ads combine all these in a book to make everything easy and time-saving. Family Dollar also announces featured items on a weekly or daily basis. Learn about the recipes and services, too. For example, PayNearMe which is a service to pay your online purchases, utility bills, loans etc. Family Dollar is a variety store and it has 8000 locations all the states apart from Alaska, Hawaii, Oregon, and Washington. One of the cheapest stores in America. Subscribe to the newsletter to get emails about Family Dollar Ads. 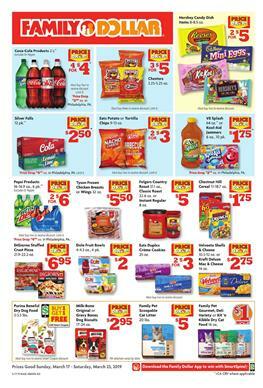 "Price Drop" is a great thing in the Family Dollar Ad March. Find many things of the ad with a price drop. Lower the cost of each item you want to buy this week. Silver Falls, Eatz potato or Tortilla, V8 Splash, Chestnut Hill cereal, Velveeta Shells & cheese, and more products are all in the Price Drop sale. Also, BOGOs are very profitable deals of the Family Dollar Ads. Speaking of discounts, we should also talk about coupon savings. One of the coupons is the promotion of the discount of Tone Body wash. Smart Coupons help customers save even more than the in-ad discounts. Find health-care and personal care items like Advil liqui-gel, Gillette disposable razors, Covergirl clean liquid makeup, Family Wellness pods are in the latest range of Family Dollar Ad. There will be a new Family Dollar Ad tomorrow. Find more products in the weekly ad preview. Follow our Facebook page, get the deals on your feed. Subscribe to get emails.